What happens when your experience of the Hap-happiest season of all doesn’t match up to the cheerful music, the smiling faces on commercials, the Instagram & FB posting perfection of your “friends”? What if the prospect of spending extended time with your family doesn’t bring you holiday cheer but holiday fear? What if the idea of “family time” brings up feelings of profound disappointment and causes your deepest insecurities to bubble to the surface of your heart and mind? If this is you, you are not alone. This time of year can heighten our sense of brokenness. Some of you are wondering, why all the negativity? You love everything about this time of year. That is fantastic! Enjoy that gift but please keep reading to know how to empathize and love those who struggle at this time of year. The truth is that the world is broken and there is great suffering, but the hope of the Bible is that God acts to rescue us and make all things new. Too often we try to numb ourselves to the pain in the world and in our own lives bypassing the proper means of grace and comfort that God has provided. This season can be a time where we feel the pain of fractured relationships, financial struggles, failed dreams and broken promises; and we look to other people or things to give us relief from the pain. The fact that others love this time of year is just another piece of evidence of our own failure. Advent in many ways is best described as a season of darkness, a longing for the better reality to come, a waiting for the return of Jesus. In many ways Advent is the season we live in all year round. In a very real sense the Christian community lives in Advent all the time. It can well be called the Time Between, because the people of God live in the time between the first coming of Christ, incognito in the stable in Bethlehem, and his second coming, in glory to judge the living and the dead…Advent contains within itself the crucial balance of the now and the not-yet that our faith requires. The disappointment, brokenness, suffering and pain that characterize life in this present world is held in dynamic tension with the promise of future glory that is yet to come. In that Advent tension, the church lives its life. We need to learn how to live as a people in this in between time, in the already and the not yet – in the Advent before Jesus comes again. We need to learn to hope in a God who is at work and is making all things new. We need to learn to watch, wait, and act in hope in the promises of God. We should no longer be surprised by the intrusion of heartache and sadness but anticipate it and fix our eyes on the future coming of Jesus. Sadly, we have lost the spiritual practice of looking forward to the day when Jesus makes all things new. Sadly most of us are terrible at waiting for anything. Pregnant mothers have much to teach us about waiting and birth pains and joy (Romans 8). We need to direct our hearts and minds to the promises of Jesus and allow them to be our comfort and strength as we wait. It is in this between time that we as the people of God, the church, learn to wait and to act in hope for the return of Jesus. We must develop the spiritual practice of looking forward to the day when Jesus makes all things new to help us in whatever circumstances we find ourselves today. Do not be discouraged if you feel the brokenness of the world during this time of year. However, remember that God kept his promise and sent Jesus the first time, and God will keep his promise and send Jesus again and set things right once and for all. My four year old insists that I sing “Away in a Manger” every evening before bed. Yes, every evening...even in July. It actually makes a very sweet lullaby. As a kid, I loved Christmas carols and taught myself all the verses to many of them. The lesser-known second and third verses of “Away in a Manger” highlight God's presence with us. As I sing them nightly in the dim quiet, the words have comforted my soul through various trials and anxieties. Do you feel bombarded this time of year by pictures of happy families in matching sweaters, spending quality time in beautifully decorated homes? My own experience of the holiday season tends to include fewer matching sweaters and more hectic moments searching for the “right” gift, with my cluttered tree in the background. (Have you ever noticed there are never slightly dilapidated homemade ornaments on the trees in those pictures? Never.) Just the word “Christmas” tends to bring a cacophony of emotions in me ranging from excitement to dread, usually landing on overwhelmed. I find myself longing for everything to slow down, for time to enjoy the more meaningful parts of the season. One of my favorite Christmas decorations to unpack is the Advent wreath. As I put it on our table, it comforts me that in December our hectic and cluttered family will slow down for just a minute (on most days), as we light a candle and read a few verses to remind ourselves what the season is really all about: Jesus, God’s promised One, coming to earth as a baby, the fulfillment of so many prophecies. These family advent devotion times give us some perspective back when we are tempted to get caught up in the shiny, shallow beauty around us. Maybe you, like us, struggle to do regular family devotions (just setting aside time to read and learn from the Bible as a family). For our family, it is usually just plain hard to work it into our schedule. May I suggest that the Advent season is a great time to start? I get it: the last thing anyone needs is one.more.thing. on their holiday “To Do” list. But if you’re going to start reading the Christmas story is a beautiful starting place. And if you actually pull off reading regularly during the holiday season, how much more possible does it seem to keep it up after the holidays?! “Advent” is simply the weeks leading up to Christmas day. The word literally means “coming” and although the origins of the celebration are unclear, the ideas around it are really beautiful. Timothy Paul Jones says, “The purpose of the (advent) season was to anticipate the coming of Christ to earth; it was a season that focused on waiting.” God’s people had been waiting for the Promised One for hundreds of years. We remember that when we slow down during the Christmas season. Jesus promised to come again and we are waiting for Him now. I am fairly certain I do not focus on the waiting very often. Sometimes I wonder if we even know how to wait, let alone if we know how to teach our children how to wait. Waiting is hard. Waiting for Christmas is good practice for some of us. Reading God’s Word together and remembering what it all means while we wait, is good too. I’d love for your family to join ours this year as we attempt to read through our devotional. 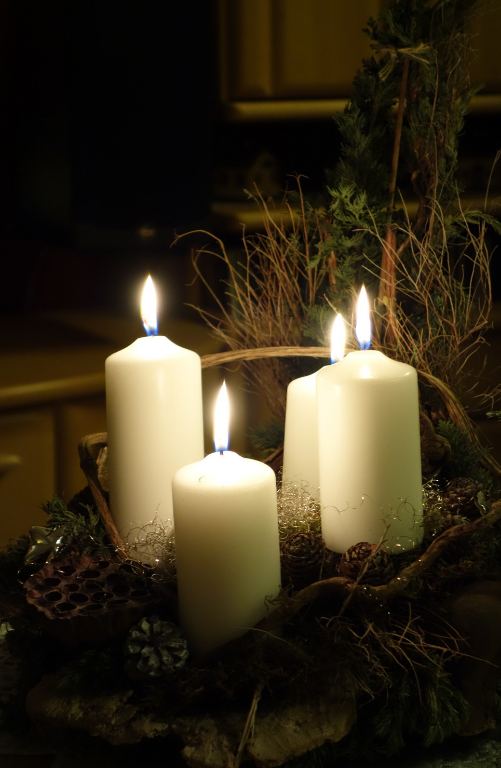 There are several advent devotional books or lists of readings out there that make it easy. (See the list at the bottom for starters.) If you decide to incorporate the wreath and candles, I should warn you: my kids fight regularly about whose turn it is to blow them out. Just saying. Cool tradition, lots of arguing. The main thing to remember about all of the little books and lists is that they are just tools. If they work for you, use them. If not, find something that does work. No matter what, don’t give up. Getting into God’s word together is worth fighting for particularly when Christmas can easily be swallowed up in shallow consumerism. So break out the matching sweaters! Put up some beautiful decorations and plan some quality time together! Encourage one another with the grand truth that right in the middle of our dark sins and deep sorrow God took on flesh and came for us. Here is a short list of Advent devotional books you might want to check out. My family will be using “Good News of Great Joy” again this year. It’s nothing fancy, but it gives us some structure and is easy to use. Typically a devo book will give you a passage of Scripture to read each day and a quick commentary on it to help you connect the ideas. Don’t get bogged down in the “every day” part –if you miss a day, just pick it up when you can. Here are a few ideas to get you started. If you find a great one, let me know.